There is a new addition among the greenhouses at the Skjærgaarden nursery – Norway's first biochar plant. Biochar is identical to charcoal (or barbecue coal), but can be manufactured not only from wood, but also from other kinds of organic material. The nursery is hosting the first biochar demo plant in Norway, which has been installed in collaboration with the cross-disciplinary research project CAPTURE+. "Our motivation for starting biochar production is to improve the soil," says Kristin Stenersen, who runs the Skjærgaarden nursery together with her husband Bjørge Madsen. "We want more robust and healthier plants, and to reduce our use of synthetic pesticides and artificial fertilisers. Of course, the fact that biochar also binds CO2 is an added benefit," she says. "People are welcome to come and see for themselves how it works in practice," says Maria Kollberg Thomassen, who is a Senior Researcher at SINTEF and Project Manager for CAPTURE+. "The project is ground-breaking because, on the one hand, we're looking into how biochar technology can be improved by applying bio- and nanotechnologies," says Kollberg Thomassen. "On the other, we're studying the economic, social and political aspects linked to the use of a new technology," she says. Sweden, Norway's neighbour, is utilising biocoal to a much greater extent. Kollberg Thomassen has recently returned from a visit to the Swedish water and waste management company Stockholm Vatten. It utilises garden waste to produce biochar which is used to help cultivate trees and other plants in Stockholm. The process is profitable because the plants require less care. It also has the advantage of handling surplus water following heavy rain. "If 4,000 Norwegian farms and nurseries produced biochar and mixed it with the soil, we could halve our emissions from the agricultural sector," says Erik Joner at NIBIO. NIBIO is one of the partners in the CAPTURE+ project, and is the organisation with the longest track record in biochar research in Norway. Joner compares biocoal with humus, which he calls the "black gold in the soil." It is humus that makes soil vital and nutrient-rich. Without it, trees and other plants would not be able to grow. But humus cannot be manufactured and, just like humus, biochar has the property of being able both to retain and then release nutrients to the plants. It is dark in colour, which means that when spring arrives, the sunlight rapidly warms the soil. It is both porous and excellent at retaining water, making it able to counteract drought conditions. "Norway's natural vegetation is rewilding, and there's a lot of forestry waste just lying around and rotting away," says Joner. "Timber volumes in Norwegian forests have increased by 25 million cubic metres, but only 12 million of these are harvested. The forests will benefit from thinning aimed at promoting growth and healthy forests," he says. "We're only in the starting blocks and it will take time for us to find our feet. But the possibilities are enormous," she says. "Stephen Joseph has inspired us to carry out an experiment that involves mixing biochar with silicon-rich waste from larvikite quarries. This can be used in addition to, or as a replacement for, artificial fertilisers," says Stenersen. If biochar is to become a factor in Norway's climate change bookkeeping, a certification scheme must be established to make sure that the carbon remains in the soil. This is essential if a carbon compensation scheme, paying farmers to plough biocoal into the soil, is introduced. At SINTEF, we call biochar a "kinder egg" – on the basis of all the opportunities it offers. It has the potential to address many challenges, including reducing the need for fertilisers and perhaps also increasing crop yields. It is probably these positive aspects, rather than its effect on climate change, that will stimulate interest among the farmers. "The public sector has an important role to play, and can take the lead in creating a niche market," says Steen. "A good example of this is the inter-municipal waste management company IVAR, based in Stavanger and Sandnes in western Norway. IVAR is planning to invest in a biochar facility, from which the surplus heat will be used to heat public buildings," says Steen. "Biochar offers major opportunities to farmers, and there is now a greater willingness in the farming community to test new initiatives than there was ten years ago," he says. "For this reason, intensive research is needed to demonstrate that it works. We're seeing that soils are becoming increasingly nutrient-poor, so we have to act now. Not least, we need climate change mitigation measures," he says. The chemical giant Elkem is one of the world's largest producers of silicon and ferrosilicon and is planning to use more biochar in its production processes here in Norway. It intends to achieve this by increasing the proportion of biochar in its reducing agent mixtures used in the production of silicon and ferrosilicon to 20 per cent by 2021 and 40 per cent by 2030. This is equivalent to emissions reductions in Norway of 450,000 tonnes of CO2. Emissions reductions will be achieved by replacing fossil coal. "We've just started a four-year research project called PyrOpt, funded by the Research Council of Norway, in which our aim is to optimise the pyrolysis process used to manufacture biochar so that it meets Elkem's requirements," says Geir Johan Andersen, who is Project Manager for the PyrOpt project at Elkem. "We're looking into opportunities to collaborate in the construction of a biochar plant of this type, and this is why it is useful to meet others and participate in demonstration projects such as that at Skjærgaarden," says Andersen. 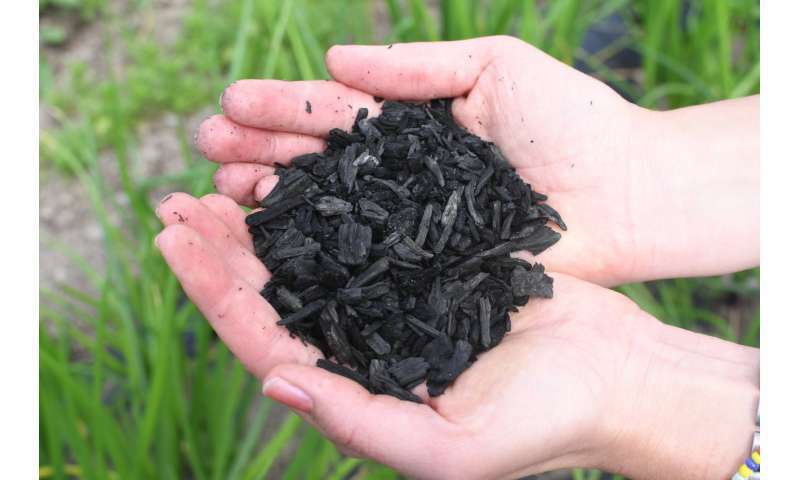 Can biochar help suppress greenhouse gases?